Officials (from left) Hyun Shick Cho, president and CEO of Hankook Tire Worldwide; Seung Hwa Suh, vice chairman & CEO of Hankook; Kwan Yong Kim, governor of Gyeongsang Province; and Baek Young Sung, mayor of Sangju City, preside at a ceremony marking the announcement of a new testing center to be built in South Korea. SEOUL, South Korea—Hankook Tire Co. Ltd. will build a $240 million tire proving grounds and engineering center on a 1,420-acre site southeast of Seoul over the coming seven years as part of an aggressive plan to improve its global research and development assets. 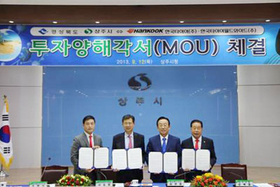 The investment is in addition to $133 million Hankook has budgeted for a dedicated research and development center in Daejeon, South Korea. The Hankook Tire Test Engineering Center—to be built near Sangju City, Gyeongsang Province in a rurual area 100 miles southeast of Seoul—will be a "global standard" tire testing facility, allowing testing of tires ranging from ultra-high performance to truck and bus tires, Hankook said. The facility will have an 18-mile-long test track capable of simulating road conditions from around the world in a variety of climatic conditions, Hankook said, allowing the company to test products designed for varying markets. Hankook called the facility "another key innovative factor" driving its tire development direction. Once completed, Hankook said it become the company's key R&D facility that will allow its engineers to design, produce, test and analyze tires as one package process in one location. Hankook anticipates having a staff of 370 at the center, which will include a driving center and children's safety experience zone. The new R&D and testing facilities will become the center of Hankook's global technology and development efforts, according to Seun Hwa Suh, vice chairman and CEO. This will be Hankook's first dedicated tire proving grounds. In addition to the R&D center being built in Daejeon, Hankook operates R&D facilities at its plant in Daejeon, South Korea, and in Uniontown, Ohio; Hanover, Germany; Jiaxing, China; and Osaka, Japan. The firm spent $105.6 million, or 1.8 percent of sales, in 2011 on R&D activities. In the past year Hankook has committed more than $1.7 billion in investments in new capacities and technology improvements and has inaugurated production at a plant in Chongqing, China, its third plant in China.